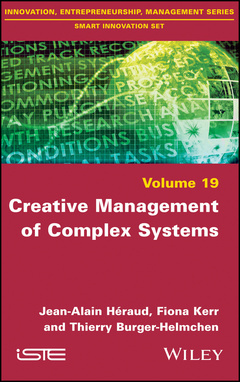 This book is a general presentation of complex systems, examined from the point of view of management. There is no standard formula to govern such systems, nor to effectively understand and respond to them. The interdisciplinary theory of self-organization is teeming with examples of living systems that can reorganize at a higher level of complexity when confronted with an external challenge of a certain magnitude. Modern businesses, considered as complex systems, ideally know how to flexibly and resiliently adapt to their environment, and also how to prepare for change via self-organization. Understanding sources of potential crisis is essential for leaders, though not all crises are necessarily bad news, as creative firms know how to respond to challenges through innovation: new products and markets, organizational learning for collective intelligence, and more. Chapter 1. Introduction: Why Do We Talk About Complexity in Management? Jean-Alain Héraud is Emeritus Professor of Economics at the University of Strasbourg, France. He is a member of the Bureau d’Economie Théorique et Appliquée, and President of the Association de Prospective Rhénane, which brings together experts in economic and social development in the Upper Rhine region. Fiona Kerr is Associate Professor at the University of Adelaide, Australia. An expert in neural and systems complexity, she is also a management consultant for various companies and organizations. Thierry Burger-Helmchen is Professor of Management Sciences at the University of Strasbourg, France. He is a member of the Bureau d’Economie Théorique et Appliquée.